10 a.m.: Rehearsals for the 8 p.m. show begin, with Puerto Rican Day Parade revelers on Fifth Avenue blending with arriving performers. At times it is hard to tell which group is more theatrical. Noon: Glee’s Lea Michele hugs Paula Abdul in the gifting lounge, tells her she looks like a “brunette Kristin Chenoweth,” and asks how high her heels are. 12:30 p.m.: Bernadette Peters walks around with dozens of butterfly clips all over her hair, collecting free Altoids. She says the hottest party she will attend this evening will be at “my house” and that it will ultimately take six hours for her hair to dry and set. 12:45 p.m.: Glee’s Matthew Morrison gives Laura Bell Bundy a big hug and holds the moment. 1 p.m.: Paula Abdul reluctantly walks over to the press corps, carrying her new free Vera Bradley bag in a slow-motion robot dance. When asked about possible replacements for Simon Cowell, she says, “Honestly, the word replacement does not apply. As we all know, they broke the mold after Simon.” Abdul’s responses are odd enough that one reporter whispers to the press corps that she must be on “vicogrigio,” a mixture of Vicodin and Pinot Grigio, and suggests she might clean up her act before she presents the award for best choreography that night. Abdul, busy talking about how she’s going to “have to somehow pour myself into my dress,” doesn’t hear this. 1:30 p.m.: Constantine Maroulis, who is hosting the Tonys simulcast in Times Square that night, says he “kind of teared up a little bit” when he spoke to Paula Abdul. Rehearsal space and the gifting lounge clear out for tech. 5:31 p.m.: If ever Broadway needed Lea Michele belting out “Don’t Rain on My Parade,” it is now. The press line is a sea of umbrellas and sopping wet reporters in formalwear. Event planners: No one thought to look at a weather forecast and rent a canopy? 5:45 p.m.: Michelle Williams of Destiny’s Child and, recently, Chicago on Broadway, has, bless her, been working the red carpet and answering inane questions about her six nieces and nephews the entire time. 6:12 p.m.: A massive swell of screams on the street announces Daniel Radcliffe’s arrival. He signs autographs in the drizzle. 6:54 p.m.: Huge screams from the fans across the street for Green Day, Ryan Reynolds, Ricky Martin — and Liev Schreiber, which is nice. About time he got some mass-market recognition. 7:01 p.m.: Danielle Radcliffe hugs Cate Blanchett in her amazing silver Armani suit and new angular haircut. He is half her size. 7:04 p.m.: Besties Jonathan Groff and Lea Michele are holding hands and practically skipping down the red carpet. She spots a man standing alone, screams, “Bill T. Jones!” and practically bear-hugs him to the ground. 7:13 p.m.: Daniel Radcliffe is just jazzed to be here. “I can’t believe they asked,” he says. “It really is amazing. I’ve only done one show. It’s so nice they still think of me as part of the community.” He just finished filming sixteen months of the final Harry Potter yesterday. Next spring, he’s coming back to Broadway for How to Succeed in Business Without Really Trying. 7:22 p.m.: The show doesn’t start till 8 p.m., but people like David Hyde Pierce, Marian Seldes, and David Bryan are filing out holding Tonys. These are, apparently, the non-televised awards. It’s still too early for anyone to have figured out how to tell the winners where to go, so they just mill awkwardly in the narrow hallway backstage. 7:45 p.m.: Mark Sanchez leads Jamie Lynn Sigler by the hand through the backstage lounge. 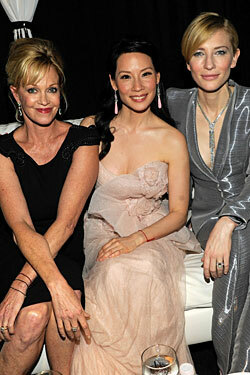 8:01 p.m.: Lucy Liu is looking a little sad backstage, sitting on a couch in her filmy peach gown as the show begins. She’s the second presenter, so she can’t go to her seat, and she’s frantically reminding herself how to pronounce everyone’s names. We tell her Green Day is supposed to perform in the opening number. “Okay, now I’m really disappointed!” she says. It will later take her a full minute and a half to gather up enough of her dress so she can walk. 8:11 p.m.: Karen Olivo, who presented the non-televised awards, hobbles by on crutches. “Just a broken foot,” she says. 8:14 p.m.: In the media room across the street from the awards, Red’s Adam Cork, who won for Best Sound Design of a Play, speaks just as Sean Hayes opens the Tonys with a ten-second long sloppy wet smooch with Kristin Chenoweth. Cork doesn’t know why the press is laughing as he describes his theater inspirations and, oblivious, continues talking to the one reporter not fixated on the television screen. 8:57 p.m.: 30 Rock’s Scott Adsit goes out to entertain the crowd during commercial break by reenacting his show, Celebrity Autobiography, in which performers read from the actual autobiographies of celebrities. His choice: Don’t Hassle the Hoff. 9:03 p.m.: Liev Schrieber comes backstage to give Scarlett Johansson a hug before they present A View From the Bridge. He appears to be the only friend she’s seen since she won her Tony half an hour earlier. 9:27 p.m.: A woman working backstage freaks out when Will and Jada Pinkett Smith pass by. Will grabs her hand to keep her calm. “Don’t touch me!” she says, and buries her head in embarrassment. “Don’t touch me?” he says, laughing, and gives her a hug. As soon as he leaves, she runs off, saying she needs to find some place to go and die now. 9:41 p.m.: Katie Finneran starts making owl sounds in reference to the owl coat she wears in Promises, Promises to the rapturous applause of the bored press room. 9:48 p.m.: David Hyde Pierce enters the room carrying his honorary Isabelle Stevenson Award. A London radio reporter tells him she’s looking forward to La Bete premiering in the U.K. and asks how things are going. “It’s terrible. It’s going to be a huge disaster.” “Well, it costs a fortune,” the reporter replies. 11:22 p.m.: Sean Hayes is making a dramatic sweep through the Tonys gala on the skating rink in Rock Center, grabbing women he knows and twirling them on the dance floor, dispensing hugs like they’re candy. 11:37 p.m.: Kelsey Grammer and wife Camille are sitting at a table surrounded by television cameras, apparently because Camille is going to be on The Real Housewives of Beverly Hills. “This is the year of the transvestite!” Grammer says loudly and with great ceremony. We ask him what that means, and immediately have to sign a release to appear on the show. 12:16 a.m.: Liev Schreiber and Naomi Watts refuse questions at the gala, saying they’re going home, but we see them an hour later at the La Cage party. 12:35 a.m.: Katie Finneran, still reeling from her win for Best Featured Actress in a Musical, says she’s going to lend both this statuette and the one she got in 2001 to a sketch to raise money for Broadway Bares. She says she’s off to a joint party for Promises, Promises and Red, and that, like Kristin Chenoweth, she always makes a point to kiss Sean Hayes with tongue. 1:25 a.m.: On an outdoor balcony at the La Cage party at Hurley’s, Scarlett Johansson is tucked away in a corner, surrounded by a circle of men, including Brian Lordes, president of CAA. She looks gorgeous and relaxed, taking long drags off cigarettes, and laughing, her Tony safely by her side. 1:38 a.m.: One flight up, Douglas Hodge, winner for Best Actor in a Musical, is having a grand time, his Tony very casually sitting on a table filled with half-finished drinks. We point out to him that some busboy might try to clear it away if he’s not careful, and he picks up the statuette and pretends to drink it. “I don’t know what to do with it,” he admits, ignoring the passersby who keep picking it up, playing with it, and making faux-acceptance speeches to each other. 2:00 a.m.: Fela! may not have won for Best Musical, but the party at Hudson Terrace is in full swing with Questlove D.J.-ing and the show’s amazing dancers standing on a center platform, doing their thing. Will Smtih and Jada Pinkett Smith had come by earlier and refused the VIP treatment, preferring to hang and dance with the little people.